Add this 23-3/4" wide x 11-7/8" deep Drill Press Table with 3" high fence and stop block for greater work support and increased accuracy. The fence and stop block slide along T-slots for quick, yet secure set-up and a removable 4" square center block allows thru-drilling past the table. 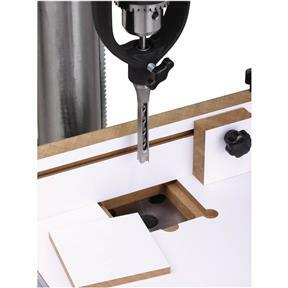 Fits all standard drill press tables and includes two universal table clamps.Mortising chisel and clamps not included. 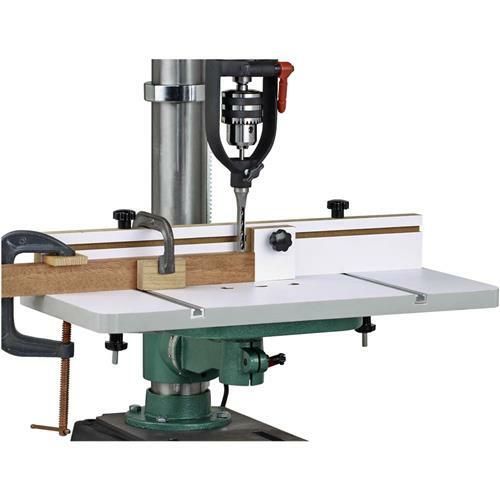 Add this 23-3/4" wide x 11-7/8" deep Drill Press Table with 3" high fence and stop block for greater work support and increased accuracy. The fence and stop block slide along T-slots for quick, yet secure set-up and a removable 4" square center block allows thru-drilling past the table. 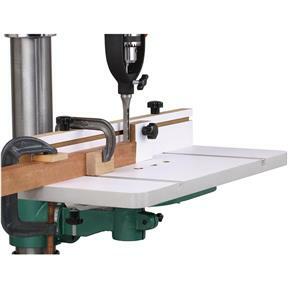 Fits all standard drill press tables and includes two universal table clamps. Mortising chisel and clamps not included. I bought this fence for my drill press but I haven't used it yet.but I am happy that I bought this. For $50 this is tough to beat. Comes with clamps to clamp to the existing table and a stop block. Setups in 5 minutes. Only issue for me is it does decrease my total capacity by about 2" in due to the way thepost is on my smaller drill press. I also have to loosen and remove the table in order to adjust the table height since the crank hits the table if the table is positioned againts the post. 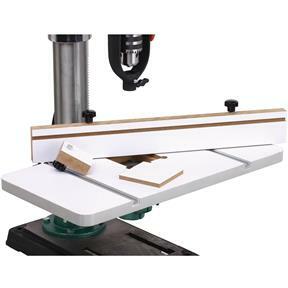 I am wanting to upgrade to a larger floor model drill press, so I am hoping that some of these issues go away when I do that. Doesn't have dust collection, however, I picked up a drill press dust collection attachment from Rockler and then cut a hole in the back of the fence. However, this does decrease capacity even further as the dust collection does stick out about 1.5" from the back of the fence. Purchased as a gift, don't know if it has been used yet. I have always had good performance with Grizzly tools in the past. For the price I was skeptical. Not bad at all. I will likely use it for quite some time to come. Showed up with minor cosmetic damage, just like everything I've bought from Grizzly so far, unfortunately. Works pretty well though. The drill press table has been an excellent addition to the Delta drill press I recently restored. It more than meets my needs. I would highly recommend it. 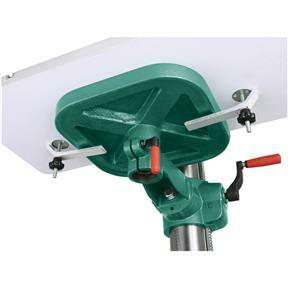 This drill press table is well designed, easy set up and use. We purchased this equipment for our grandson for a Christmas present. He loves it. I have given him your catalog and he will probably visit you sometime in the future. Gave this to my son as a gift, and he loves it. It has made his JET drill press much more useful. Pleased with this product. Have used for 1 month.